The Five Ten Moccasym is a high-performance climbing shoe designed to excel at everything from the most difficult boulder problems to multi-pitch sport climbs. 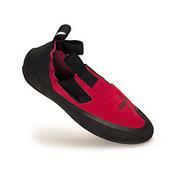 The Moccasym is a good second shoe for versatile climbers. The shape of the Moccasym's last was designed to strengthen your big toe for maximum front point power and precision. Moccasyms smear like no other and are firm enough to hold the foot on a thin edge or crack. Breathable split-leather uppers with elastic insole bands provide a skin-tight fit and sensitive feel. The patented side exit heel seam minimizes hot spots and blisters typically associated with seam stitching. Five Ten's innovative Stealth C4 sole will assure you'll stick to the slickest of rock. Keep in mind that leather climbing shoes tend to stretch. You may want to purchase them one-half to one full size smaller than your normal shoe size. Most of the stretch will be in the width, although they will stretch a little in length.